Solar power is energy that comes from the rays of the sun which hit our small planet everyday, at least for 12 or so hours (daylight hours). This excludes the polar regions where the sun shines and sets, following a completely different ritual. However, this power or light energy whatever you may call it, can also be called renewable energy that can be harnessed to obtain heat or electricity. Yes, the sun’s light can be transformed into heat or electrical energy, if we so desire. However, the process of transformation is somewhat different for both the cases. In order to get electricity from the sunlight, we need photovoltaic panels or solar panels while solar heat collectors provide us with solar thermal energy to get hot water for our daily use. Solar power can also give rise to wind power in a round about way. If you have ever studied Geophysics, you will understand what happens when a particular spot on the earth’s surface gets overheated. The overheated surface air gets lighter and rises up, leaving a near vacuum condition there. Since no vacuum can exist on the earth’s surface, air from surrounding area rushes in to fill the vacuum. This result in strong wind which runs big windmills in Netherlands and this also helped the seagoing vessels in the past. Of course it currently helps running of wind turbines that generate electricity. Regretting the digression into wind power, we may concentrate on solar power once again and see how electricity is magically generated from sunrays. But for this, we may have to go back a few years (1953) when a team of scientists from Bell Laboratories developed the first silicon solar cell that was capable of generating a measurable amount electric current and called it the solar Photovoltaic cell. However, after many years of research, the modern photovoltaic cells are capable of generating sufficient power and when assembled in the form of Photovoltaic, home solar panels or commercial solar panels, they can fulfill the electrical needs of a home or workplace. Though the solar power comes in DC form, it is run through an inverter to turn it to AC 120 volt for regular household use. A battery bank added to the system aids in storing the power for later use. Solar power, as earlier mentioned can also be harnessed to heat water with the help of panels that are installed on rooftops and known as solar collectors. A little more detailed discussion may be helpful in determining the efficiency of solar water heaters of which the Integrated Collector Storage type happens to be the simplest. Here a tank-full of cold water in a well-insulated glass or porcelain cover is placed in the sun facing south. While cold water is piped to the bottom of the tank, hot water is collected from the top. There are many advantages of solar power. Being eco-friendly, you can gain from the many alternative energy incentives that are on offer. Solar power can also drastically reduce your power bills. 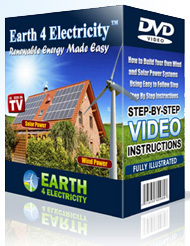 Do you want to gain from solar power? You can because installing a system is really easy. All you need is some information on the best place to put it up, ways to install and wire it, and the safety precautions. You will also need to know where to get the parts and batteries from cheaply.